Since I seem to be on a breakfast theme today, I will share my technique for scrambling eggs. I mentioned in my last post that when I was younger, my favorite breakfast was a cheese omelet. As I've gotten older, I don't like omelets as much. This probably has more to do with having to do the cooking myself than it does with actually preferring the cooking method. I find omelets unnecessarily fussy. I am happier with a simple scramble. I think everyone does scrambled eggs a little differently. Some people like a drier, more well done egg. 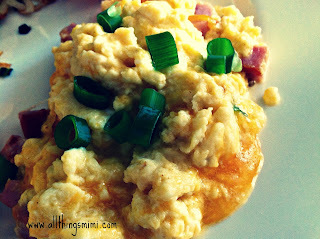 I am a runny yolk person, so I like a softer, moister texture to my scrambled eggs. I learned this technique from my friend Lizard. She is an amazing cook and she shares my obsessive love of really good food. Anyhoo- the best way I can think to describe this method is low and slow. What makes barbecue meat so wonderful also transforms eggs to another level of yumminess. I usually use 4 eggs if I'm cooking for Dev and myself. I think a good rule of thumb is at least 2 eggs per person. I break the eggs into a medium bowl and add a pinch of salt. I used to use milk in my eggs, but I have switched to water. I'm sure you can look on the internet and find good reasons to use either one. I don't see a huge difference- and sometimes I don't have milk! I also use a little more than a teaspoon of sriracha chile sauce in my eggs. I think it gives them a bit of a kick- but most people don't even know it's there! I whisk the eggs vigorously. They should be completely combined before you cook them. At this point I chop up whatever I'm going to add to my scramble and grate some cheese. I heat a non-stick skillet over medium low heat. I melt a pat of organic salted butter to the pan. On this particular morning I had a piece of ham steak left in the fridge and decided to throw it in. If you are using veggies or meat, go ahead and add it to the skillet after the butter melts so you can heat it up. I let the ham pieces sizzle for about 5 minutes. Don't turn the heat up. The secret to these silky eggs is a low cooking temperature. Pour the beaten eggs in with the ham or other veggies. Scoot everything around and then leave it alone for a couple of minutes. You will be tempted to turn up the heat to make it cook faster- BUT DON'T DO IT! Your patience will be rewarded. Every few minutes, run your spatula through the eggs and scoot things around a little. You don't want to let big curds form. As the eggs begin to set up, keep them moving around. At this point you should be stirring them constantly. When they look almost done- throw in your grated cheese. I don't put cheese in at the beginning because I think it effects the way the eggs set up. Waiting until the end preserves the flavor of the cheese and the texture of the scramble. Scoot it all around for about another minute, then plate the eggs. I like to use warm plates to keep the eggs warm as long as possible. I garnish the eggs with fresh parsley and/or chopped scallions. Sometimes I don't have either and I just eat the eggs the way they are! Try this method to make scrambled eggs. Tweak it however you need to. Breakfast is such a great meal and you can always make better breakfast at home!